Apple eventually announced iPad Air and iPad mini 2 on Oct 22, which means numerous Apple fans will queue up for these two new tablets after a short while. Then what will you do on the fifth-generation iPad or the second-generation iPad mini? Without even a second consideration, I guess you will surely import and watch your favorite videos on the amazing iPad Air or iPad Mini 2. But some widely used files like AVI videos are hardly playable on iPad Air even though Apple's official site said iPad supports the AVI files with Motion JPEG. This is because many AVI videos nowadays are no longer encoded with the Motion JPEG codec. Therefore, you cannot play AVI files on iPad Air directly. How to resolve the AVI incompatibility issue for your iPad Air? Do you want to import AVI video to iPad Air for playback anywhere anytime? Well, all you need is a smart iPad Air video converter, called MacX Video Converter Pro. This software can not only help you convert AVI to iPad Air compatible format on macOS with awesome video quality but also let your video file conversion finish with world's fastest speed. No.1 iPad Air video converter for Mac (Mojave) to convert AVI/MKV/MP4 and more to iPad Air (iPad Air 2/mini 4/Pro etc) supported formats with 5X faster speed and no quality loss. You will also thumb up for its wide support of video input and output formats. With 320+ video and 50+ audio codecs, this AVI to iPad Air converter is able to convert any videos like MKV, M2TS, MTS, AVCHD, MP4, MOV, FLV, AVI, WMV, etc to iPad Air and transfer these videos to make them playable on any platform, be it Apple phones or Android tablets. Besides, by taking full advantage of Intel's Quick Sync Video hardware acceleration tech, this video covnerter for iPad Air brings the world's fastest iPad Air conversion speed! Below is the step-by-step guide on how to play AVI on iPad Air's high-resolution screen. Free download this top video processing program on Mac computer, install and run it. Drag and drop the AVI file you want to convert. Or go to "Add File" button to locate the AVI file you want to add. There is an optimized presetting provided for your iPad Air or iPad mini 2. To do it, go and hit "Apple Device" -> "to iPad Video" and choose the specific generation of iPad at your fingertips. Then click "Done" button to finish the output format selection. Tips: This iPad video converter for Mac offers awesome "Edit" button for you to touch up your AVI video file. For instance, you can hit the "Trim" button to get your favorite video segment for watching on your iPad Air, navigate the mouse to the ""Crop & Expand" button to adjust the AVI video size to better suit your iPad Air's screen, click the "Subtitle" button to add external SRT subtitle to the AVI video, add watermark to make it personalized, and even merge several AVI files into a new one. Click "RUN" button to start converting AVI to iPad Air on Mac. You can view the conversion progress and are able to cancel the converting process at anytime. After a short period of transition, you can add AVI file to your iPad Air via iTunes sync and play AVI on iPad Air without limitation. Tips: This video converter for Mac has been updated with new support for YouTube downloading, screen recording, slideshow making, etc. 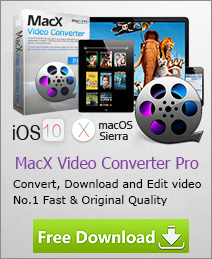 For more detailed information, please head over to its official Mac video converter page. Do you want to convert video for playback on iPad tablet? 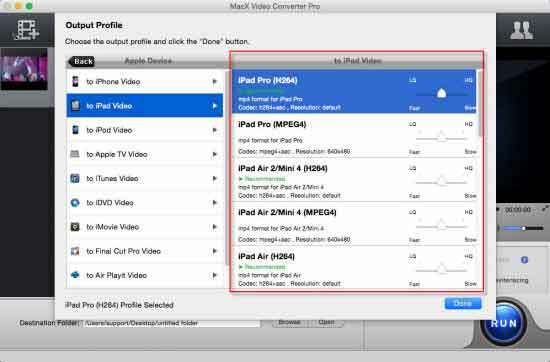 This article shares 3 best video converter for iPad and tells you how to convert MKV M2TS FLV AVI to iPad/5/4/iPad Mini viewable format easily with the best iPad video converter software. Eager to play YouTube video on the new iPad Air? Hold on, this tutorial shares you a wonderful iPad Air video converter that is able to download YouTube video and convert other videos like WMV, MP4, AVI, etc to iPad Air easily, so that you can play any video on iPad Air anytime anywhere.